What's the easiest and cheapest way to buy and add Net10 minutes? You can buy Net10 refill cards at many stores or click here to purchase Net10 airtime . You can also sign up for a monthly no contract plan called Easy Minutes. And finally if you're a heavy user you can sign up for one of the unlimited plans or other 30-day plans. There are now two kinds of cards. You can buy the regular pay as you go cards that cost about 10 cents a minute or the monthly plans cards. The minutes from the pay as you go cards do rollover, but the minutes from the $25 750-minute cards do not rollover. In addition, you do lose your minutes when you switch from one kind to the other. Look at your airtime usage and decide which makes the most sense. Note: Don't have a Net10 phone? Then your starting rate can be even cheaper because you can buy a Net10 phone and minutes card bundle. Pay as you Go Cards refill your Net10 airtime balance at the rate of about 10 cents a minute. When you activate these cards, your airtime is added, and your service date is extended by a certain number of days. Any airtime you already had is rolled over. Note the screenshot above is from when Net10 was offering a 100 bonus minutes on your first three refills after buying a Net10 phone. This is no longer offered. You can add Net10 minutes in denominations of $20, $30, $45, $60, and $100. The $20 refill card gets you 200 minutes and extends your service for 30 days, or approximately one month. This card is included as a bonus on some Net10 phone packages. It's really not worth it as a separate purchase, because you can get 750 minutes with the $25 card which is also extends your service for 30 days. The $30 refill card gets you 300 minutes and extends your service for 60 days, or approximately two months. The $45 refill card gets you 600 minutes but only extends your service for 60 days or approximately two months. This brings your monthly cost to about $22.50. Again, this is not really worth it compared to the $25 1000 -minute 30-day card. The $60 refill card gets your 900 minutes and is valid for 90 days or approximately three months. This brings your monthly cost to about $20 per month. The 1500 minute card costs $100 and extends your service for $180 or about six months. This brings your monthly cost to about $16.67 per month with the minutes costing about 6.7 cents. If you think having to keep buying these airtime cards either in the store or online will take up too much of your time, you can set up auto-refill or sign up for one of the . . . There are three 30 day cards or plans, the $15, $25 and the $30 cards. Your minutes carry over with the $15 and $30 cards, but you have to refill every 30 days. They do not carry over with the $25 card, but you get many more minutes. The $15 30 day card gives you 200 minutes which works out to 7.5 cents per minutes for airtime. The $25 30 day card gives you 500 Net10 minutes. This works out to about 6 cents per minute, which is pretty good, and 6 cents per text, which is OK. The $25 30 day card gives you 1000 minutes which works out to 2.5 cents per minutes. However, these minutes do not carry over to the next month. The best comparison to this is the related Straight Talk $30 30-day plan which gives you 1500 minutes (and messages) every 30 days, but where you also get a separate 30 MB data bucket. With the Net10 $25 card, the data comes out of your main airtime bucket. The Unlimited plans give you unlimited talk, text and even data (except for the $35 plan) with varying amounts of high-speed data. After you use your high-speed data, you data rate is subject to being throttled down. Unlimited Talk and Text Only? This may be useful if you use your cell phone all day as you might for, say, business purposes. Or maybe you're just a chatterbox or constant texter. For $35 you get unlimited talk and text but no high-speed data. It's unclear whether there is any data available at all with this plan. It may only be compatible with their basic phones and not their smart phones. These cards offer unlimited talk, text and varying amounts of high speed data. You get 500 MB of high-speed data. You get 2.5 GB of high-speed data. You can get a $5 discount if you sign up for auto-refill bringing the cost down to $45. You get 2.5 GB of high-speed data and unlimited international calling as well. You get 5 GB of high-speed data. The old "Easy Minutes" plans are now part of the 30 Day plan. The rates are the same, but it appears that Auto-refill is now an option rather than a requirement. 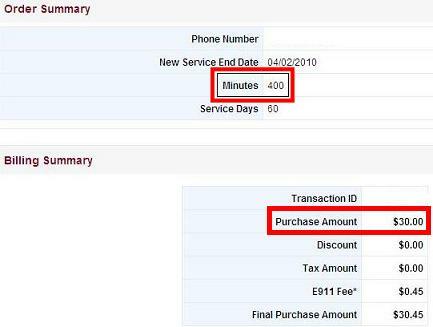 It's unclear whether you can still add additional airtime bundles in quantities of $5.00 for 50 minutes, $10 for 100 minutes and $15 for 150 minutes as before. These minute bundles were available as one-time purchases and would not change your monthly plan. Of course if you're willing to just give up your credit card info and just press a few measly buttons every couple of months then you could instead sign up for Net10 Airtime on Demand. Then when you're either running low on minutes or your service is about to expire, you can buy airtime straight from your phone. Sign up here to buy Net10 minutes directly from your phone. Just make sure to cancel this if your phone gets lost or stolen. You don't want to buy minutes for someone you don't know. Customer satisfaction has been great, and though they've introduced some new plans, that will hopefully continue to be true. Thanks for reading this Net10 Minutes review. Share your experience about getting minutes! Why can't I buy Pay as you Go Net10 minutes in my Dollar General store? As Net10 has both monthly plans and prepaid plans with rollover minutes, you might be interested in the related brands, Straight Talk and Tracfone. Since Tracfone is all about the airtime and, er, tracking it, it turns out there are a few pages (sorry about that) on this site about it. You can find out more about how to add airtime or figure out just how many minutes you're going to get. Straight Talk has both an unlimited plan as well as a monthly plan with a limited number of minutes, texts and data. In that case, you may want to know how to check your balance. The Gophone system in contrast tends to display the actual dollar value of your airtime rather than the minutes. However it's displayed, eventually you have to refill your airtime.